Valin Corporation provides system solutions for industrial facilities that require filtration, automation, fluid management, precision measurement, and process heating products. The company also offers engineering, assembly, and on-site field support services. Valin works with businesses in the technology, energy, natural resources, life sciences, and transportation industries. Valin is based in California and has 16 locations throughout the western United States. One of Valin’s warehouse locations wanted to create clear boundaries around hazardous areas, work areas, and places where movable equipment (like trash bins, carts, etc.) should be placed. In wide-open floor spaces, it wasn’t clear where equipment belonged and where it was safe for people to go. The company used solid white and solid green SafetyTac® tape to create boundaries around work cells. Valin also used hazard (yellow/black) SafetyTac® to outline areas where people need to use extra caution such as in places where vehicles enter the facility and near fire extinguishers. Floor marking shapes also helped Valin achieve its goals. 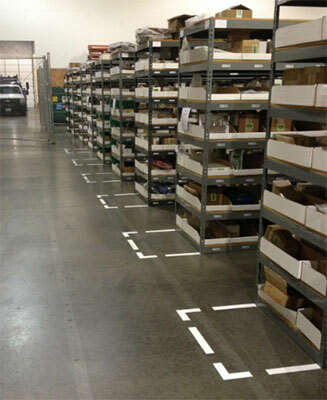 White strips and corners were used to mark areas where movable equipment such as carts and bins are placed. Combined, these markings break up floor space into color-coded areas. The new floor markings help employees and visitors to Valin’s warehouse better understand where things should go, where extra caution should be taken, and where work cells end. It is now easier to work in and move through the warehouse. 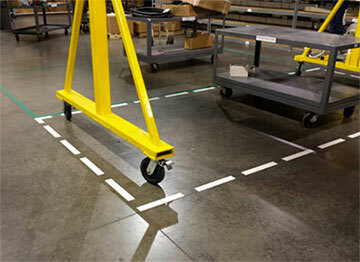 Try marking work cells and other significant areas in your own facility with floor markings.